Inside Solid: who will build the “god platform” for the Internet of Things? Everyone is racing to build the topmost layer for home automation. Everyone’s racing to build the “god platform” for the Internet of Things: the highest, most generalized layer of intelligence and user interface that ties together connected devices and web services. It’s tempting to look for analogy in mobile phone platforms, where Apple was initially dominant and now enjoys an extremely lucrative and influential minority position against Android. There are some crucial differences, though. For starters, adoption won’t be quite as easy; domestic appliances last for a long time, and nothing consumers have seen yet makes connected laundry seem appealing enough to justify early replacement of a washing machine. And even in cases where replacement is relatively easy, the grandest promises entail stitching everything into a seamless system — replacing just the easy stuff can seem pretty lame. Mobile phones initially channeled existing behavior (Facebook on a desktop browser) into the convenience of availability anywhere (Facebook on a mobile app). The jump from light switch to mobile app is much more dramatic, and, frankly, light switches are a pretty refined and satisfactory technology. So, companies that want to participate in the home automation market will need to create products that work compellingly in isolation and alongside competitors’ products — and somewhere in all of this, the god platform might emerge. A dialogue about this arose in a long e-mail chain among the Solid team over the weekend. I’ve edited and excerpted some of it below; we’d welcome additions to it in the comments section. “Household devices are getting smarter these days: the so-called Internet of Things is bringing software-controlled thermostats, lighting, and other appliances into the mainstream. Many companies are fighting for a piece of the pie, but Logitech is taking a different approach…they’re trying to build remotes that will control all of a home’s smart devices. ‘Logitech doesn’t want to own the device; it wants to own the app experience. But to do that, it had to build a software overlay and a controller that would convince people to put it in their homes. So, it’s offering a $100 hub that combines IR, Wi-Fi, Bluetooth, and RF that will let you use the Logitech Harmony app to control gear that uses those protocols.’…They’ve worked out partnerships with a lot of companies that are big in the home, like Nest, Honeywell, and Philips, all of whom seem to want this extra layer of control for the user. Interesting. This has to happen — it’s hard to imagine a world in which every device has its own app. I wish it were happening via standard protocols, and I’m not convinced that trying to do deals with each device vendor is going to be anything except for a nightmare. But if nothing else, maybe this will start the protocol conversation. I’m surprised that Nest, Honeywell, Philips, etc., are willing to let Logitech “own the app experience.” I mean, I think someone will eventually emerge and own the whole app experience, but that seems like the most valuable part of the system — the part that’s most likely to produce integrated, insightful data at the highest level. It’s something I’d expect these vendors to fight over, but maybe they see the lack of an integrated experience as a barrier to adoption. There isn’t much integration work on the part of the companies, which is why Logitech threw every wireless radio in the box. That said, it doesn’t go far enough — the promise of IoT is about the experience, not just a universal remote for all your things. Many companies are trying a “whole” app approach, like the Works with Nest program, Google’s Thread group, etc. What the Apple experience will do that I think ultimately will force companies to join is Apple will have both the hub element with Homekit/Apple TV and the key always-on-you product with iPhone/Apple Watch that connects to all of these devices while you’re at home. From here, a whole ecosystem of services through apps can emerge that bridge the interactions with Homekit (a la IFTTT) to eventually anticipate/predict your patterns and bring you real value. It’s the Internet of Me. A few sensors in the home aren’t enough to guide this experience, as companies like Nest are learning in dealing with multiple people and pets. I think that Apple is pretty well positioned. This stuff is all about adoption of an entire network of compatible devices/services/user behaviors in a pretty short time frame, and they’ve been building their ownership of people’s entire home device ecosystem for years. They own the screens in people’s pockets, laps, (some) television stands, and are making the strongest effort thus far at the wrist. They’re also doing deals with car manufacturers for in-car media systems. They know the specs of these devices, protocols they talk on, and own the software that connects them, already. Also, interface is really a big deal on this stuff — like Luis was saying, it’s about the experience. It needs to be like a butler — anticipating your patterns but staying out of the way. I like those always-on voice control boxes, but I don’t know if people are ready for them yet. I don’t think that most people want to feel like they are living inside a computer; they want to feel like stuff just works better and that there is more information there if they want it. But the physical interface can’t feel foreign. Nest is a really great example of design with this principle in mind. Then all of your stuff could know what you were doing just by the manner in which you touched it. I mean, come on — there’s totally enough information to know that you want to pair your new wireless speaker to your phone in the way that you interact with those objects naturally. You pick up the speaker, turn it on, then touch the thing you want to pair it with less than a second later. You could also do even weirder stuff like connect your pacemaker to IFTTT. I disagree that Apple owns people’s phones (iPhone has pretty small share now, albeit a lot of profits), or that they yet own the wrist. Their wristwatch share will always be some subset of smartphone share, and again, Android is way ahead on smartphone share. And the Android Wear watches are pretty darn awesome (if not yet as beautiful). Further, this all requires a big data competency that Apple hasn’t demonstrated. Google Now is light years ahead of Siri on that front. I don’t know who’s where on the TV front, or the car front, but I think the Android OEM strategy will trump, just like it did on smartphones, and years ago in PC vs Mac, and before that in Sony Betamax vs VHS. Apple is ultimately Sony. I’ll grant that it’s a horse race, but I’d say that the odds are against Apple. I see them helping create and validate new categories, but ultimately falling behind. So, there is certainly a significant market out there for $600 phones, and a large number of people willing to pay several times that for home automation products. But over the long run, smart homes are going to penetrate into the middle (and maybe even the low end) of the market. Apple isn’t interested in that, and really can’t be interested in that, because it would compromise their hold on the high-end market. The only way out would be to create a separate label, just as GM owns both Chevy and Cadillac. But that would be very un-Apple, and it usually works the other way around: Volkswagen owns Porsche and Bentley, not vice-versa. You’re correct about the luxury positioning here, and I think that doesn’t necessarily weigh against Apple at the outset. For the next couple of years, at least, home automation will be a luxury market, and that’s the period in which influence will be established, if not market share. Recall that smartphones were a somewhat unusual luxury product for the first year or two that the iPhone was out; I think the fact that they’re now ubiquitous in developed countries is owed to Apple establishing a market, and Apple is still incredibly influential in this area, even though its market share has been shrinking since the early iPhone era. By home automation as a luxury market, by the way, I don’t mean that it’s particularly expensive or inaccessible — just that most of these products are (or appear to consumers to be) entirely discretionary. Lockitron and Nest are cool, but there are plenty of other things that Americans are preoccupied with that cost less than $180 or $250, and connectivity on things like washing machines is still an expensive add-on without a clear purpose. It sometimes feels to me like everyone I know is buying smart-home electronics (myself included), but then I remember how different the consumer landscape in the Bay Area, New York, and Boston is from that of the rest of the country. Home automation will have a lot to prove to consumers. I agree with David on voice control, with products like Ubi or Jibo still being a ways away. They make sense in the home only if you’re close enough for the device to hear you. I’ve sometimes yelled out “Hey, Siri” in case my phone or iPad is nearby and listening, like an omnipresent being available to answer our spontaneous questions. A watch could be a better voice remote since it follows you everywhere. Alternatively, Nest could add microphones to its products (Dropcam already has one) and have a Google Now presence all over your house. While the idea of the smart home is great in principle, mainstream smart home adoption feels at least 10 years away. There are too many products people currently own that have another five-10 years of life left in them, and if they break in the interim, who’s to say the one they’re buying will come with the right radios or protocol — in which case, you’ll wait another 10 years to buy the next one after that. I still don’t know the benefit of owning a connected washing machine. For this reason, and the fact that all their major product lines are tools for delivering software apps and media, I’m not sure Apple cares much about leading an app war for the smart home. The only area that would have a similar disruptive app store in them (in addition to the watch) is TV. But I don’t see us buying apps for our toaster or thermostat, or upgrading to the latest Toaster 6 Plus, or even a hardware app store emerging, like littleBits is trying to do. I don’t see much money in this approach. How would IFTTT monetize any of this? Security is a big issue as well. A few more of these incidents and consumers will run from the Internet of Things. I worry about Google being in my home now with Dropcam and the fact I am currently Google’s product to advertisers. Apple seems to be more cautious about protecting consumer trust by not storing health data or fingerprints in the cloud. They’ve taken the same UI of the single button they pioneered on the iPhone to then authenticate a fingerprint, and now to make a secure payment. A step further could be analyzing your heart rate biometrics through that same phone button to even further identify it’s you. 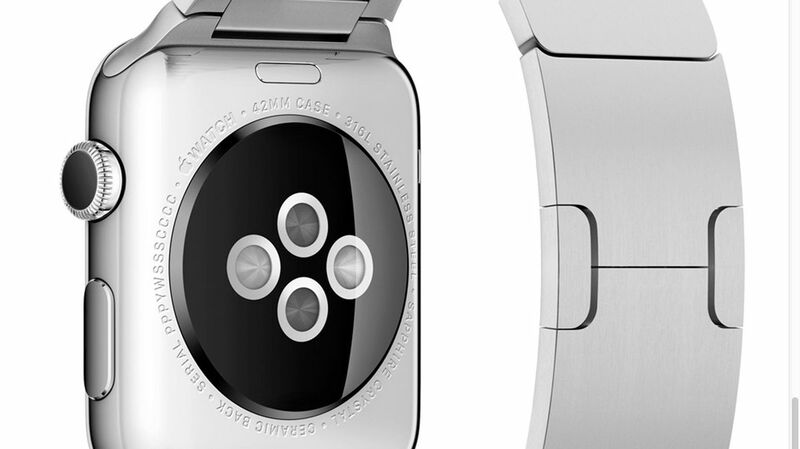 And who is Apple kidding with the four giant sensors on the back of the watch only tracking pulse? Check out the one from Basis for comparison. Apple’s partnership with IBM to play in enterprise and big data could also be really interesting if they are able to leverage Watson’s brain and Siri’s voice to analyze business, health, and other data. It’s this depth of design intent that gets me excited about Apple’s approach. I’m fascinated by the idea of virtual touch and using the watch’s capacitive touchscreen pressure sensor to recognize on one end and the linear actuators deliver pressure output on the other — its the digital translation of touch and further blurs the hardware/software line as you practically push through your screen onto someone’s wrist. Reminds me of that old AT&T slogan. On Tim’s point about the Android/OEM model, The CTO of Oculus [John Carmack] gave a very candid keynote on the state of their product, including frustrations with the fragmentation of Android (point against the Android/OEM model) and working directly with Samsung to bypass “Android development hell.” Few companies will be able to have this approach, but it addresses a key point of the importance of the hardware and software being increasingly intertwined and optimized for each other. Cropped image on article and category pages by tanakawho on Flickr, used under a Creative Commons license.